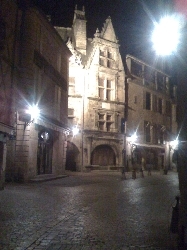 Welcome in Sarlat the heart of the Perigord Black in Dordogne. The Lady of the violette it's a lovely romantic nest in the centre of the mediaeval town of Sarlat, just few steps away from the cathedral and from more than 40 restaurants, brasseries, cinemas and theatre. Perfectly located and just restored this cozy apartement of 53 sq metres, has everything you need to have a vacation you will not forget. Ideal for honeymoon, romantic setting in a city is considered one of the most beautiful cities in the world. 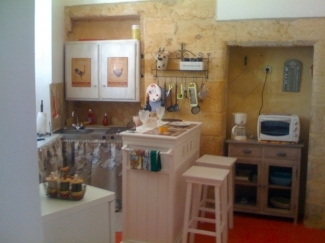 The house where is located the apartment is dated before than X century as the town, and everything here is a real jem. 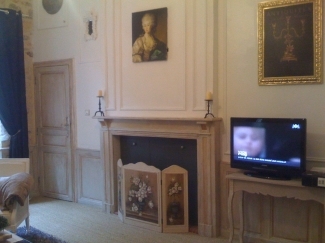 Composed by a kitchen with oven and hob, a sittingroom with a 1600 fireplace, wifi and cable tv. 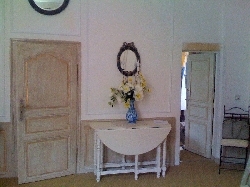 Dressing room, a bedroom with a kingsize bed and a bathroom fully furnished. 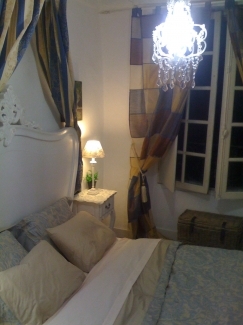 The property has been renovated completely and has been furnished with class and charme. You will be surprised by the thousand of things to see and to do here, and visiting the area, the town and setting in the Lady of the violette you will leave in Sarlat a piece of your heart, and in change the town and the Region will leave to you something that you will never forget! The closest airport where also low cost flights are available are: Bergerac, Limoges, are more far away but still close Toulouse, and Carcassonne, Bordeaux.... and from 2010 the new airport just 15 km away in Souillac, will be available. Setting in Sarlat you will have thousand of things to see and to do, between you can choose. Please find below just a list, of few things, but visiting also my other pages of Sarlat and Dordogne you will have much more ideas. Everything around mean history, you can leave between mediaeval houses, discover castles on the hills, eat the famous "foie gras" and enjoy the prehistoric caves, but you have so many things to see and to visit that you will be surprised. Sarlat is the capital of Black P�rigord, is an exceptionally preserved city. More than 1000 years of living architecture through the streets, the rooftops of lauzes and stone walls and hot blonde. Sarlat became a city in the 8th century. Boundary between the Kings of France and England during the Hundred Years War, it became French in 1360 and released ten years later by Du Guesclin. The cathedral of Saint-Sacerdos was built under Henri IV. From the 18th century, Sarlat dormant for 150 years before becoming successful with the arrival of the railway. 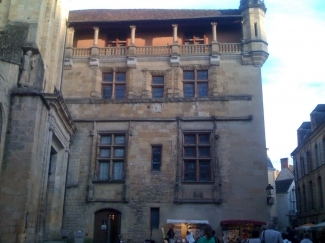 The exceptional number of listed buildings or ordered per square meter because of Sarlat the first European city in terms of heritage. 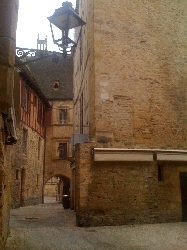 Sarlat has long been the natural setting of many films. The challenge is to choose! The wisest course would be to return. Sarlat offer many openair events or inside her buildings, concerts, drama, movies festival, festival of food, art showrooms and exibitions. 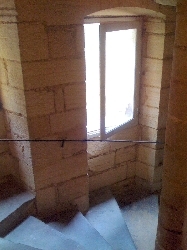 Please visit the links you will find in Sarlat to have more details and the dates. Everyweek, on wednesday and on saturday all day all year around, offer a spectacolous market just few metres from the house. You can walk through food, frech specialities, spices, herbs, parfumes, clothes, materials....The people come from all over to visit this marketto buy fresh fruits, vegetables and many more. After the access to the heart of the caves by the electric train, the visit starts at the chaos room and continues to the tarasque hall where a rock seems to represent some fabulous animal. The elegant silhouette of the Ch�teau de Hautefort is situated on the summit of the plateau that dominates the valley of Beuze and Lourde. Proumeyssac is currently the largest developed cave in the P�rigord. Listed as an historical monument, "the Ch�teau" is not only the Perigord's best kept secret, but also the most unusual and most shrouded in mystery. Pal�olithique sup�rieur -35 000/-10 000. The fac-simile, of the original cave at 200m, reproduction of the Taurus hall and the others. A discovery unique in Europe for garden lovers, professionals and simply for those who love nature. Canoe in the Dordogne or a tour on the boat on this wonderful river! 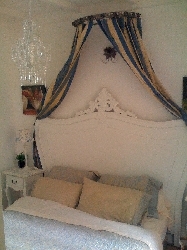 The weekly rental rate is fully included. Discount of 25% for monthly rental.